In our experience, companies tend to have one of two problems with social marketing: 1) they can’t think of anything to post, or 2) they’ve got so much material that they overwhelm their audiences — which means that their brilliant messaging and razor-sharp wit gets lost in the noise. Regardless of which category your company falls into, an editorial calendar is what you need. Creating (and continually maintaining) a social editorial calendar is hard work, but our new template, Your Sample Social Editorial Calendar, should help you streamline and simplify the process.You can use the editable PDF to fill in blanks, check relevant boxes, and craft your own social schedule. 1. It helps you maintain a consistent cadence. Cadence is crucial when it comes to social — once you’ve set expectations with your audience, you’ve got to maintain them. If you tweet 10 times a day in your first month on Twitter, and then don’t make a peep for days, you lose credibility. That’s where a calendar comes in — it’ll help you even out the times of feast and famine. If you have more material than usual, you can just pop it on next week’s calendar; if you notice the calendar for the coming week is light, you can gather some new material with time to spare. 2. You can map time-sensitive content ahead of time. We keep our content, social, and PR teams closely aligned, so that blog posts containing new announcements, releases, or awesome new content assets are firmly on the calendar weeks in advance. At the end of each week, we send around the blog topics for the following week – this way, any “last minute” changes aren’t actually at the last minute. 3. You’ll take your social marketing out of a silo. Once you’ve plugged your social schedule into a calendar, it’s that much easier to share. 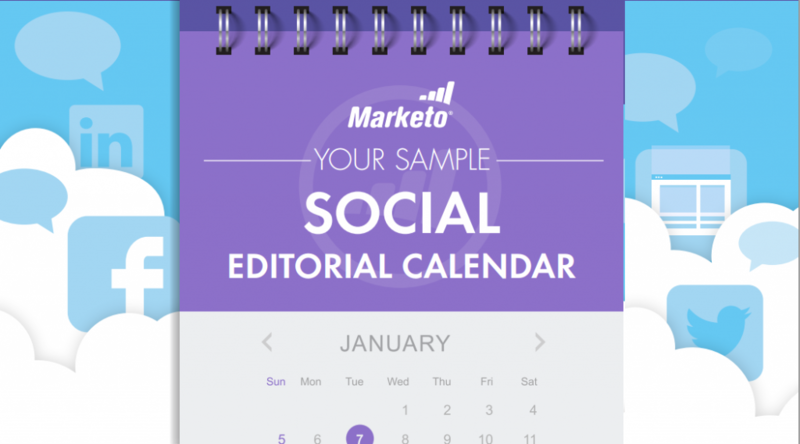 At Marketo, all stakeholder have access to our social editorial calendars. This means that all relevant teams (PR, demand generation, content, SEO, and PPC) all have a chance to weigh in on social posts before they are published, and are able to coordinate their own activities. 4. It serves as a system of record. A calendar isn’t just for planning out your future social posts — it’s also for recording your posts from the past. It isn’t easy keeping track of which ebook you’ve already tweeted about, or which event you’ve already advertised on LinkedIn, especially if you have multiple people on your team. Your editorial calendar will serve as your social system of record. Keeping an editorial calendar helps you stay connected to the “411 rule” — the rule which says you should try to post four educational, entertaining posts for every one “soft promotion” (such as an event promotion) and one “hard promotion” (such as a demo). At Marketo, we use this approach in email marketing, on our blog, and especially in social, because it allow you to find common ground with your audience — common ground besides that fact that they might one day buy your products. Using an editorial calendar is a huge part of keeping your social posts balanced, because it gives you big picture visibility into the type of posts you’re publishing.